POST a QUESTION or READ FAQs about this article topic. What can we install to protect a water pump from damage if the well runs out of water? How do we protect the well pump from damage due to pump short on-off cycling? How can we protect the well pump and its circuit from electrical overloads or lightning damage? This article describes all of the devices to protect water pumps from damage from continuous running, short cycling, overloading, no well water, low yield wells, power surges, or lightning strikes. Watch out: A water pump or "well pump" can be damaged by conditions that cause the pump to run continuously, particularly if the pump is running "dry" - without water passing through its mechanical parts. The result can be the need for a costly repair or for pump and control replacements. Well pumps can also be damaged by other conditions such as low voltage, lightning strikes, entry of debris in the well water, or corrosive water. Turn off the pump right away - if you let the pump run dry for too long it's likely to be damaged. see WATER PUMP WONT STOP RUNNING. The problem may be something easy such as a cut-out pressure set too high, or it may be more trouble, such as a well that has a very poor flow rate. In between are problems such as debris-clogging that prevents a pressure switch from properly sensing water pressure or leaks in well piping. at WATER PUMP PROTECTION SWITCH we describe all of the various devices installed to protect a well pump and its wiring and controls. My pump keeps running and wont shot off, I have good water pressure. I live in the North (Nunavut) and our water is supplied by truck and held in a 700 gal. tank. Sometimes when it storms and the trucks fall behind schedule and we run out of water. The problem is when this happens the pump continues to run and if we don't catch it quickly it heats up and ruins the impeller centre or the bearing. My question: is there a shut off I can install on the pump or water line that will shut the pump off when the tank is empty. 1. TURN IT OFF manually so you don't burn up the pump motor. Yes there are more sophisticated water pump controls with sensors that can shut off the pump it it's pumping air. Typically these work by monitoring the current draw of the pump, the pump motor temperature, or actual water flow. There are also water pick-up "tailpiece" fittings intended for use in a well that might work in your tank that will recycle water through a pump to prevent its burn-up when water runs too low at the source. Built-in Electric Motor Overheating Protection: some electric motors including some submersible well pumps include a built-in electrical overload or temperature overheat control switch that will turn off the electric motor if it's too hot. On inaccessible motors such as a submersible well pump the overload or overheat switch includes a thermal sensor that will automatically re-set the switch when the motor cools down. Other electric motors may include a pop-up switch that must be manually re-set. Electrical circuit breakers or fuses found in the electrical panel feeding the electrical circuit for the pump motor and its controls are designed to turn off electrical power to a water pump or well pump circuit if the circuit is drawing excessive current at an unsafe level. Watch out: if you find that a well pump is continually tripping a circuit breaker or blowing a fuse you should leave the circuit OFF as it has become unsafe. Flow Sensor Switch: flow sensors are controls mounted in line in water supply piping that sense water flow or movement in the pipe. Used typically on irrigation systems, these water flow rate sensor switches can be used to measure actual water flow rate, compare that to a set standard, and shut off the pump if the flow rate is too low (running out of water) or too high (a burst pipe). Recommended: Flow Valve to protect pumps on low-flow-rate wells: a flow valve such as the Dole® Valve flow restrictor (for example a GB-3.0 or other suitable model) can limit flow rate in a well pumping system to a flow rate that is less than the in-flow rate of water into the well bore. The flow restrictor valve is placed in the piping line between the water pump discharge port and the water pressure tank. In this position the water flow rate can be restricted to protect the pump from damage from running dry - as will happen if the pump draws the well water level down to below the pump inlet. The installer will determine the proper flow restrictor size (in gallons or litres per minute) by using an adjustable gate valve placed between the pump outlet and the water tank. The gate valve is partially closed with the pump running, thus restricting the outflow from the pump's dischage port. The level of water in the well is monitored. When the pump has run at this reduced output long enough to be confident that it is not pumping faster than the well's recovery rate the output flow is measured (in gallons per minute for example) and an appropriate flow control valve is selected and permanently installed where the gate valve was located. The Dole® Flow Regulator is self-cleaning and designed to deliver a constant volume of water flow over a wide pressure drop range. The controlling mechanism is a flexible orifice that varies its effective area inversely with applied pressure so that a constant flow rate is maintained. - retrieved 25 Feb 2015, original source: GE Infrastructure Water & Process Technologies, "Dole Flow Control Valve", GE Corporation (2004). Dole valves are presently produced by Water & Process Technologies, a General Electric Company located in Trevose, PA, TRel: 215-355-3300. The company has offices world wide and its products are distributed to end consumers through plumbing suppliers. Dole valves and similar devices are sold in flow rates ranging from 1/2 GPM (1.9 LPM) to 12 GPM (45.4 LPM) with inlet pipe diameter connections varying accordingly from 3/8 FNPT to 1 FNPT. Watch out: be sure to install the flow restricting valve in the proper position, with its arrow correctly matched to the direction of water flow. 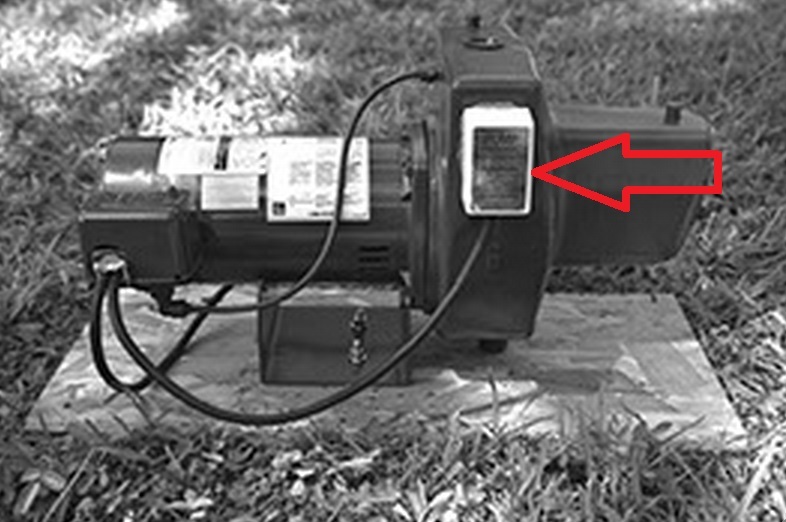 Lightning protection for well pumps may include surge protection or other special devices. The LPS Low Pressure Switch electrically shuts off the booster pump if the feed water is interrupted. The LPS is designed to be mounted on the inlet side of the pump. Although the pump will not be damaged if operated without feed-water, pumping air into the membrane for extended periods can damage the module. We strongly recommend this device for applications where feed-water shut-off or interruption can occur. The LPS includes a wiring harness (not shown) that interconnects a pump and transformer. Water pump pressure control switch with low-pressure cut-off feature: such as the Square D Pumptrol FSG2J24M4BP electromechanical pressure switch shown in our phto, or the similar Square D FSG2J24M4CP Water Pump Pressure Switch with Low-Pressure Cutoff, sold under the PumpTrol or SquareD brand produced by Schneider Electric. Pumptrol™ Pressure Switch Class 9013, Types FSG, FYG, FSW and FYW. At low water pressure this switch will shut off the water pump system until it is manually re-set. Depending on the operating pressure range for normal cut-in and cut-out water pressure factory pre-sets in this switch, Square D offers 21 different Pumptrol water pressure control switches, of which six have a built-in low-water-pressure cut-off feature, four have a manual cut-out lever, and two include a pulsation plug. Form M4 only—Low water or loss of system pressure will cause the pump to be cut off. After the fault in the system has been corrected, move the lever to Start [marked in the side of the plastic case] and hold it until enough pressure builds up to keep the contacts closed. On the Square-D Pumptrol FSG2J21M1 switch (which looks just like the switch shown below) the manual lever cut-out option allows users to temporarily remove power for periodic maintenance. On the Pumptrol M1 switch, the maintained manual cut-out lever on this switch has auto and off positions. Re-set is manual. That means that unlike the M4 model above, on an M1 switch if you lift the lever to an OFF position, it will stay there until you move it to the ON or RUN position. 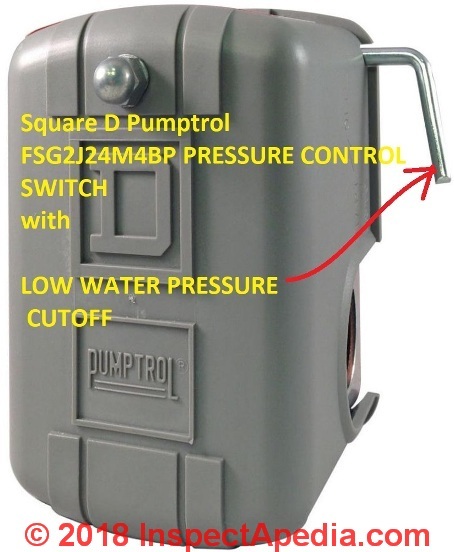 Square D 30-50 PSI Pumptrol Water Pressure Switch FSG2J21M4CP with Low Pressure Cut-Off (shown below) is similar. Other Square D pump controllers include models that do not include low pressure cutout features: FSG2J20 (20/40 Cut-in/Cut-out), FSG2J21 (30/50 Cut-in/Cut-out), and FSG2J24 (40/60 Cut-in/Cut-out). Other similar pressure switches are used on air compressor and air pump systems. Those are not intended for use on water systems. 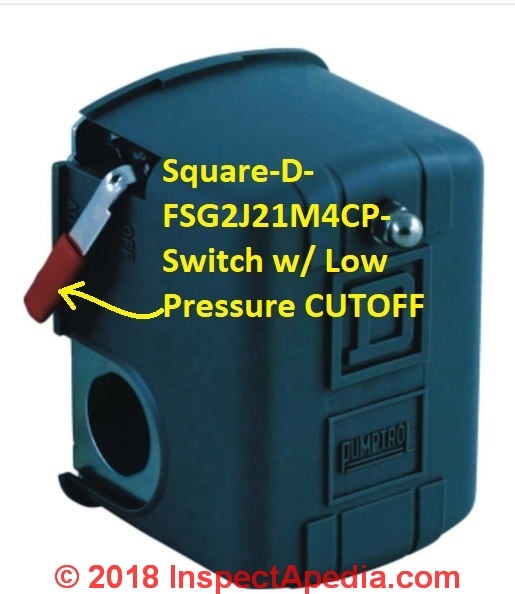 See this SQUARE D Pumptrol® PRESSURE SWITCH CATALOG for examples of this pressure switches that include an automatic cut-off in response to low or no water flow or pressure. See WATER PUMP PRESSURE CONTROL SWITCH for information about water pump pressure control switch diagnosis, repair, or installation & wiring. Recommended: Water pump relay switch with built-in low pressure or overload cut-off features. Larger horsepower well pumps, usually submersible models, are switched on and off by a heavy-duty pump relay switch that is itself operated by the water pump pressure control switch described above. 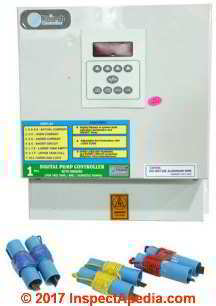 Pumptec is a microcomputer based pump protection device that continuously monitors motor load and power line conditions to provide protection against dry well conditions, waterlogged tanks, and abnormal line voltage conditions. Indicator lights provide complete system status, which can be easily viewed without removing the cover. Pumptec interrupts power to the motor whenever the motor load drops below a preset level or the load drops quickly. Pumptec is optimized to work with Franklin 2- & 3-wire single phase motors from 1/3 to 1.5 HP. An underload (dry well) adjustment is provided to address unusual situations. The PumpTec controller uses three indicator lights to indicate power, electrical load, and voltage levels. An "underload" indication can indicate that the well is dry while an "overload" indication typically means that there is a problem with the pump motor, causing it to draw excessive current. 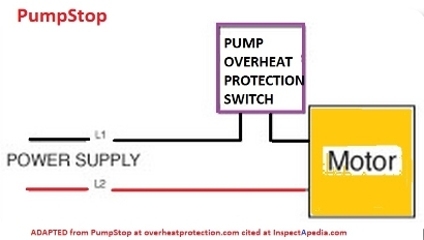 PumpStop universal pump protection switch [shown above in a photo & wiring sketch from the company's website] for jet pumps & centrifugal pumps, protects against loss of pump prime, stuck or failed pressure control switch, broken valves, stuck relays, loss of water in the well itself, user error, check valve failure. The switch is simply wired into the pump power line input tothe pressure control switch, in series. Pump overheat damage is caused when water stops flowing and the pump continues to run. This causes the water in the pump to get very hot resulting in total system failure. The POP 120 shuts off the pump before overheat damage occurs, keeping the pump system safe until repairs can be made. The instructions for installing this device call for interrupting either of the two 120V input or "hot" wires to a 240V pump pressure control switch to wire the PumpStop in series. Indeed switcing one-leg of a 240V circuit should turn off the pump. Watch out: safety hazards remain when you power off only one leg of a 240V circuit if someone working on the circuit thinks that all power is off when in fact one leg remains live or "hot". You might check with your pump manufacturer and with the manufacturer of any other controls that may be wired in the circuit, asking about the effects of interrupting only one of the power wires to the pump. We have on occasion heard from readers who got into trouble interrupting one leg of the two 120V legs that typically power a 120V motor or circuit, depending on how those two legs were used. A reader asserted that on loss of one leg of the 240V pump circuit, their particular pump continued to run but at a slow speed. For example when a remaining 120V leg of a circuit is left "hot" there may be current leak or safety risks remaining at the wired device. Generally a pump or other electric motor won't be damaged if there is full voltage or no voltage provided to the device. Reduced voltage can cause damage. We requested clarification from the manufacturer via their website contact form on 7 Oct 2015 - follow-up will be posted here. Watch out: 240V circuits are not wired identically world-wide. The pump protection switch and simple wiring diagram shown above are for a North American installation. In the U.S. and Canada a 240V60 Hz circuit is "single phase" and does not make use of a neutral wire and the two legs complete a 240V circuit. But in the U.K. 240V 50Hz is provided on a single phase circuit by one single wire, always requiring in addition a neutral wire to complete the circuit and a ground or "earth" wire for safety. See WATER PUMP RELAY SWITCH for details about these and similar pump relay controllers. Water pump short cycle stop valves are devices intended to detect short on-off cycling of the well pump and to shut down the pump. 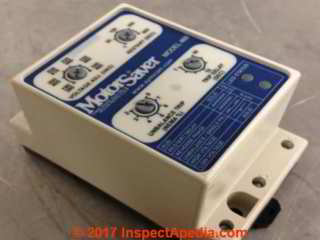 Well Pump Overheat Protection Switch, Model POP 120 sold by Discount Sprinkler, 6831 Tierra Verde St., Pt. 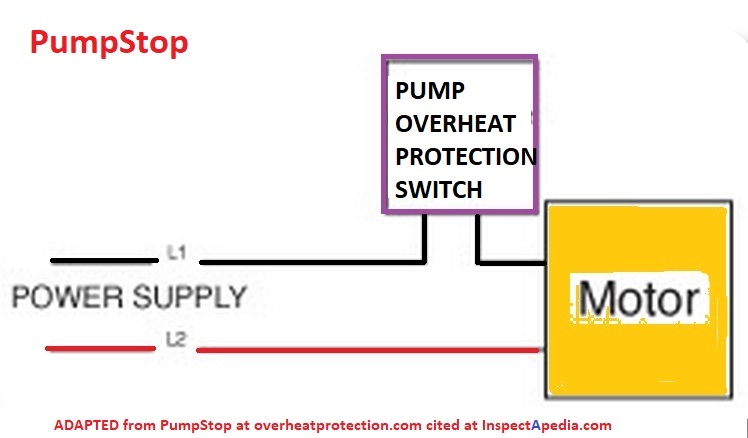 Richie FL 34668, Tel: 727-841-7000, Website: overheatprotection.com, Email: pumpstop120@gmail.com. If the pump gets "hot" this thermal sensor will shut down the motor to allow the pump to cool down. Watch out: This switch will shut down the pump after 10-15 minutes of dry & "hot" running, give a 30-50 minute cool-down time, then will allow the pump to re-start. The manufacturer opines that this cycling will not damage the pump. But I'm not sure this is exactly suitable for your situation as the switch, like a thermal overload switch used on some electric motors, can reset and allow the pump to start again when cool. Repeated cycling of a water pump running dry, even with a cool-down period, may still damage the pump impeller or bearings. Well piping tailpiece: a WELL PIPING TAIL PIECE is a device installed in the well at the foot valve or at the submersible well pump to detect that water level in the well has fallen to a too-low level for safe pumping. When water falls to this low point and the pump runs water circulates in the tailpiece (or inside the submersible pump) to prevent pump overheating, but actual withdrawal of water from the well is slowed or stopped entirely to protect the pump. Note that a well pump that is seizing or otherwise drawing excessive electrical current should also trip the circuit breaker or blow a fuse. I had a pumpsaver plus installed, now it seem I have less water. A pump saver device, of which there are several device types using different methods, is designed to protect the pump from damage if well flow rate is poor, by preventing the pump from running from then on (thus being damaged) by recycling water through a tailpiece as pump runs - until the well recovers. I would look at the well flow rate to understand your issue with water delivery rate. The pump is pumping water from the river. Yesterday I pulled up the foot valve and brushed it to clean it. When I changed the pressure switch I had to take off that small clear plastic hose that goes to the switch and I let it run. Does it help to mention that this pump is a small one half horse power and it is over 40 years old. Indeed the same debris that clogs a foot valve can clog the small diameter tube through which water pressure is transmitted to the pump pressure control switch. For a pump that shuts off unpredicatably I'd take a look at the operating conditions when that happened. For example: was the pump running for a long time before it shut off ? The motor may be shutting off on thermal safety. Or was the voltage abnormally low? Same response. OR was well water level run out? There are various well pump protection devices and circuits that will shut down the pump motor. my well water supply will have no water. after turning off the electric supply for an hour or so the water supply returns to normal. Also the motor seems to run for a long period before it turns off. Sounds as if your well is running dry. Or a pump motor is overheating, or a pump protection device is installed. Franklin Electric Co., Inc. Franklin Electric Co., Inc. Question: what do pump protection switches cost? The MP 204 monitors the following parameters: Insulation resistance before start-up Temperature (Tempcon, Pt sensor and PTC/thermal switch) Overload/underload Overvoltage/undervoltage Phase sequence Phase missing Power factor Power consumption Harmonic distortion Run and start capacitor (single-phase) Operating hours and number of starts. You may have also seen the words dry run protection used when looking for information on pumps. Dry run or dry running protection is when a pump is intuitive enough to identify when the water source from which it’s running has run out, for example when the water tank is dry. The pump will automatically switch off upon detecting the lack of supply water, protecting the pump from incurring any damage. Some pumps have an automatic re-start function, which will try to re-start the pump at regular intervals to check whether water has become available. A ‘pump cycle’ is the start and stop of a pump. Some applications may cause a pump to ‘cycle’ or start and stop repeatedly in a short period. This repetitive starting can cause motor, control or pump failure and can also cause pressure fluctuations that may lead to failure of the pipe or other fittings. Cycling will definitely cause discomfort for the user, especially when the water is used for applications where hot and cold water is mixed. A pump that has an anti-cycling feature will protect it from failure when cycling is detected. Some pumps an also feature built in thermal protection in the motor or control panel. Thermal protection is incorporated into pumps to protect the motor and components from dangerous overheating that can cause pump failure. Overheating generally occurs when the motor is overloaded, bearings seize up or something locks the motor shaft from turning. When this happens, excessive heat builds up in the motor. Pumps with thermal protection will automatically trip the motor circuit to keep it from burning and damaging the motor. Water Pump Protection Switches in the U.K.
Pedrollo Company, U.K., distributes Brio Tank 12A pressure sensing controller £92.00, and the Presflo Pump Controller (Easypress), £76.00, and the Italtecnica pressure control switch series and the Danfoss pressure control switch series, Pedrollo Distribution Ltd Crossfield Fort Crossfield Road Industrial Estate Lichfield Staffs WS13 6RJ Tel: 01543 415200 U.K.
DeltaM provides a pump protection switch that includes an alarm, possibly not for residential water well applications. FCI FlexSwitch FLT93 pump protection flow switch from Fluid Components International (FCI) detects dry running conditions caused by irregular liquid flows or slurries and can provide an alarm feature. Grundfos GO [Mobile App Product Description - PDF] - mobile tool box for professional users on the GO. Grundfos GO gives you intuitive hand-held pump control, and full access to all the Grundfos Online tools on the go. Low Pressure Switch (LPS) installs on the inlet side of the booster pump and will shut-off the pump if the feed water is interrupted. The wiring harness (included) interconnects to the pump and transformer. Factory settings are set to turn the pump off at 3 psi and back on at 8 psi. The Model 777overload relay can be used to protect any 3-phase motor drawing 2-800 amps (external CTs are required above 90A). It combines overload, underload, voltage and power monitoring functions in one package and has a 3-digit display for viewing voltage, current, and last fault information to simplify diagnostics. Continue reading at WATER PUMP INTERMITTENT CYCLING - pump runs for "no reason", or select a topic from closely-related articles below, or see our complete INDEX to RELATED ARTICLES below. WATER PUMP PROTECTION SWITCH at InspectApedia.com - online encyclopedia of building & environmental inspection, testing, diagnosis, repair, & problem prevention advice.